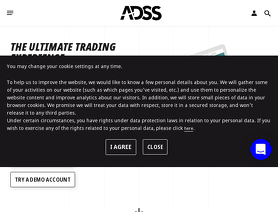 ADSS is a forex broker. ADSS offers the MT4, MT4 Mobile and OREX forex trading top platform. ADSS.com offers over 55 forex currency pairs, cfds, commodities, indices, gold, silver, bitcoin and other cryptocurrencies for your personal investment and trading options. , it was good initially until recently I have been taking trades and almost every single trade of mine instantly stopped out,... I just wonder how they do that! be careful every one avoid this broker at all costs , you cannot trust them, you will end up losing more as soon as they find out you are doing great in trading,,, and mostly they hunt your trades during low liquidity hours.. speacially this year market was highly illiquid due to political uncertainties.. so be careful every one and avoid this broker.... they sometime spike the prices and also cause disconnection in the platform too and some time you may see trades in your account that you may never intended to take them.. Excellent trading platform and overall trading experience. I have been a client of ADS since they were still considered a small broker and have never had anything but a good experience. Any self directed FX trader in Dubai is crazy if you trade at any other broker because ADS is clearly the superior firm. I could not recommend any higher to anyone (anywhere) for a good trading platform. Enough good broker be sure. I dont know about bad comments below but i tell that is ADS good broker if you trade gold. I have had good spreads (exept the night time) 25-30 pips. I have had different slippage (as positive as negative but enough acceptable). My last broker was more worth. I did 3 withdrawals and yes i waited 3-4 days every but for me it dosent metter. that is broker under FCA it is safely! ADSS securities is a bad broker, stay away from them. - You never get the price that you hit, always added or subtracted 2 cents on SP500. - Their Live Chat is worthless as you never get someone chat with you. - Withdrawals are a night mare, I am chasing them for the last 5 weeks to get back my balance and close the account, but no success yet. - Queries through emails take 2 days to get a reply that is always useless. So, please stay away from them and look for other brokers. multiple tickets opened with no respond from broker. I was not able to log in to my account either. Requested multiple times to help me reset the mt4 log in with no respond! requested withdrawal, said it will be processed but never happened. This is I compel to informing to "ADS securities" through "FPA" to stop their mails sending me. As I am not their Customer, but once I have been opened an account for announced of a No deposit bonus, which they not granted me, and the matter is over. and even I also sent them an email on 23.11.2016, in this regard. But they kept continued sending mail. And this is a very very bad attitude. This broker reminds me a lot of CMC markets. Stop hunting is prevalent, the price high and lows are often >1% more than the actual market, and one is constantly on the phone to customer services to query incorrectly executed orders. Stop hunting price spikes also trigger EA transactions that should never be executed had the price reflected the actual market. I am not in the business of constantly having to prove incorrect pricing and unrealistic price execution, and if their business model is to bleed suckers, then I am no competition for the vast array of excuses this broker proffers. The demo data (which many traders will use to test EAs) is rigged. This dealer has adjusted the price data to reflect daylight saving hours by correctly adjusting the close of market time but have left the opening market time unchanged (apparently both open and close of market times should be changed). I have to say; I have never come across this tactic before. Which means EA testing on the demo account...well do I need to explain? ADS claims to pass on both negative and positive slippage but the negative slippage occurs on 99% of orders, and positive slippage occurs on 1% of trades and is less than 5% of the size of the negative slippage. It seems they are doing an FXCM. Regardless what the broker says, one develops the conviction that one is trading against the broker and most of the trading time is spent second guessing the dealer's next stunt. It takes five working days to receive funds which are very slow for the UK. In my view ADS Securities UK is a bucket shop, and traders who use Expert Advisors should stay far away from them. We build EA so we can leave it alone to trade; trading with ADS means one has to spend an exorbitant amount of time monitoring the broker for ill and bucket shop behaviour. STAY CLEAR!! !